Built at a cost of nearly $25 million over a thirty-year period, Philadelphia City Hall stands as a monument both to the city’s aspirations to greatness and the extravagance of its political culture. 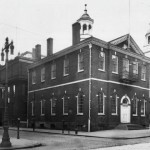 Philadelphia’s second City Hall, at Fifth and Chestnut streets, immediately adjacent to Independence Hall, was completed in 1791. 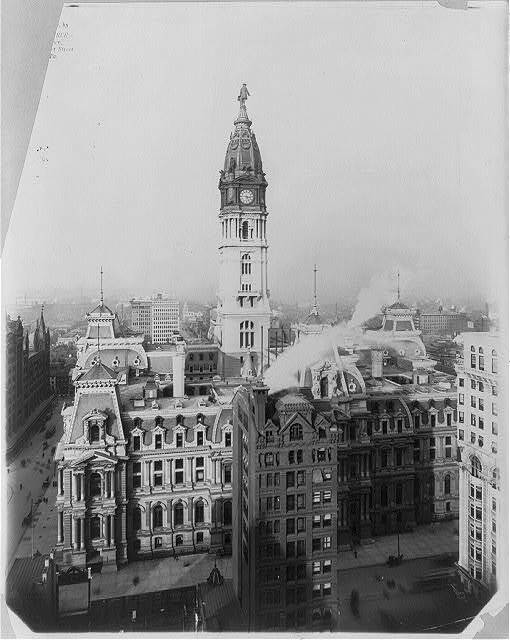 It succeeded the city’s first city hall, built during William Penn’s lifetime, at the heart of the commercial district, on Second Street. The new facility hosted the mayor’s office and council chamber on the second floor and the mayor’s court on the ground floor. During the years Philadelphia served as the nation’s capital, from 1791 until 1800, the U.S. Supreme Court shared space with the mayor’s court. The building served as the volunteer headquarters during the yellow fever epidemic in 1793, and, in less perilous times, as the location for naturalization ceremonies. Philadelphia City Hall, completed in 1901, took nearly thirty years to construct. 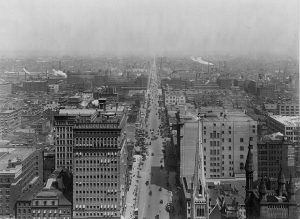 This masonry structure towers over the Philadelphia skyline at 548 feet in height, providing panoramic views over the city as shown here in an aerial view of North Broad Street c. 1911. City Hall ranked as the tallest building in the world until 1908, when the Singer Building in New York City surpassed it. In the early twenty-first century, City Hall remained a gathering point for events including festivals, protests, and presidential campaign stops. 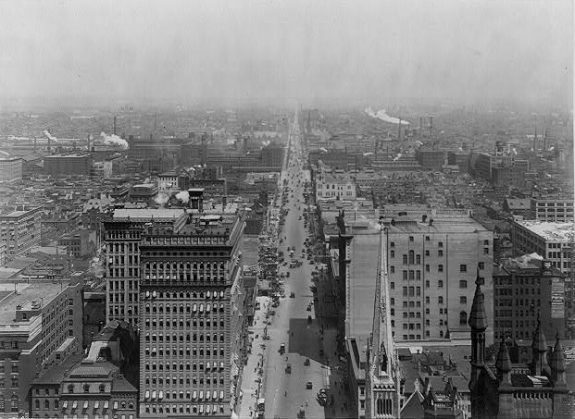 The building that once towered over the Philadelphia skyline recessed into the shadow of modern skyscrapers, but the iconic view of William Penn still towers over Broad Street. Each side of the main tower sports a clock face that unifies the neighborhoods around the city center. At the top, facing northeast, stands a 37-feet-tall bronze statue of William Penn. 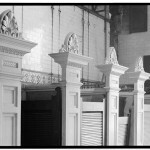 Below, the central courtyard is an exchange point for SEPTA’s Broad Street Line, Market-Frankford Line, and trolleys. 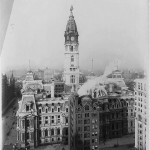 Originally designated by William Penn as a location for municipal buildings, when it was known as Center Square, the area subsequently renamed Penn Square was selected for the new city hall only after a prolonged debate. 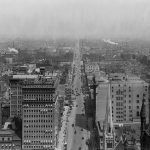 In placing the new structure at the intersection of Broad and Market streets, the Public Buildings Commission formed to oversee construction helped consolidate the city’s commercial center west of early development at the Delaware River. The location also helped traction magnates consolidate their financial power by forcing an existing street line to share its right of way along Market Street. Statue of William Penn, Alexander Milne Calder, prior to full assembly. 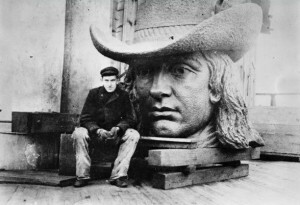 At thirty-seven feet and 27 tons, the massive bronze statue of William Penn placed atop the building’s bell tower has presented a distinctive welcome to Philadelphia. In the completed work, Penn carries the Charter of Pennsylvania from King Charles II. The Charter rests on a tree stump, symbolizing the first tree cut from his "Green Country Town." 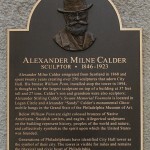 A tribute to the sculptor who created City Hall's distinctive sculptures, including William Penn. Constructed over a thirty-year period at a cost approaching $25 million, Philadelphia City Hall stands as a monument both to the city’s grand ambitions and to the extravagance of its political culture. 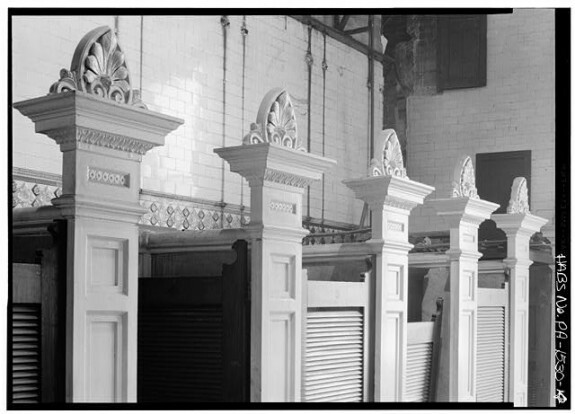 Controversial from the outset–for its location, its architecture, and the patronage it commanded on behalf of its construction–the structure nonetheless came to be embraced over time as a distinctive emblem at the heart of a great city. The massive masonry structure owes much to the consolidation of city and county in 1854. 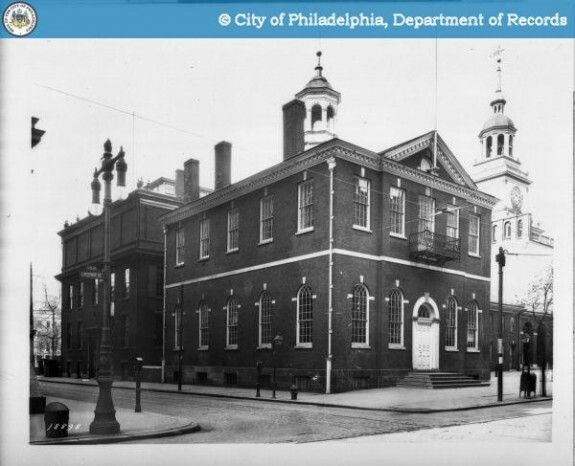 In doubling the city’s population to 565,000 people, consolidation required the expansion of services that outstripped the capacity of the two-story building at Fifth and Chestnut Streets, designated in 1791 as the city’s second city hall. As early as 1838 the Pennsylvania legislature recognized the need for new municipal offices, but disagreements focusing largely on the location of the new structure prevented action until the 1870s. 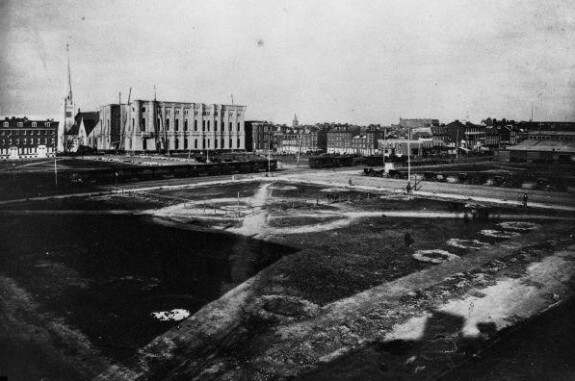 In 1871 the question of location was put to popular vote, with the result favoring Penn Square to the west, where the city was expanding, over Washington Square at the heart of the city’s early commercial center. The grand scale of the new structure reflected the city’s aspirations—futile in the end—to reassert its position at the top of the American urban hierarchy. Seeking to attract a leading architect for the project, the city sponsored several competitions, ultimately awarding the commission to 39-year-old Scottish-born John McArthur (1823-90), whose buildings in the city had included the Wagner Free Institute of Science (1859) and the Public Ledger (1866). It did not hurt that he received coaching from Thomas U. Walter (1804-1887), architect of the U.S. Capitol from 1851 until 1865, with whom McArthur had trained. Walter subsequently served as a paid consultant to the project. 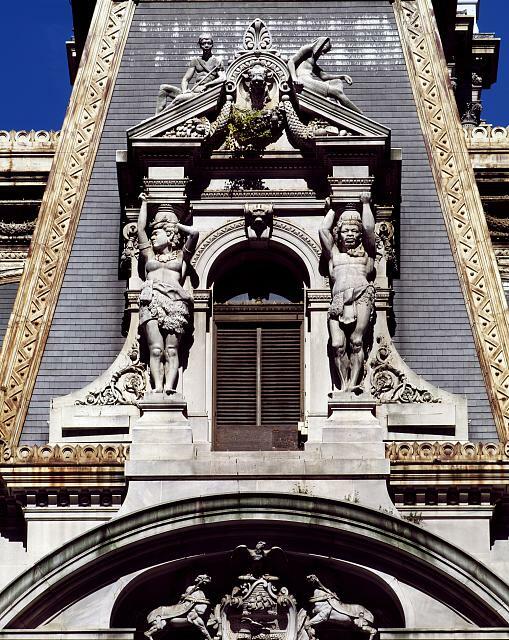 Cast in the fashionable French Second Empire style—the same style simultaneously embraced for the structure later known as the Old Executive Office Building in Washington, D.C.—City Hall mixed thick masonry construction, up to 22 feet in some places, with elaborate ornamentation inside and out. Intended to be the highest building in the world, with its bell tower topping at 548 feet, by the time the building was completed in 1901, it had been surpassed by the Washington Monument and the Eiffel Tower. Still, it could claim to be the world’s largest occupied structure until it was surpassed by New York City’s Mutual Life building in 1909. By gentlemen’s agreement, no other building role above City Hall in Philadelphia until 1987 with construction of One Liberty Place. In line with the city’s ambition, no expense was spared in the building’s construction. Most striking was the statue of William Penn placed atop the clock tower. 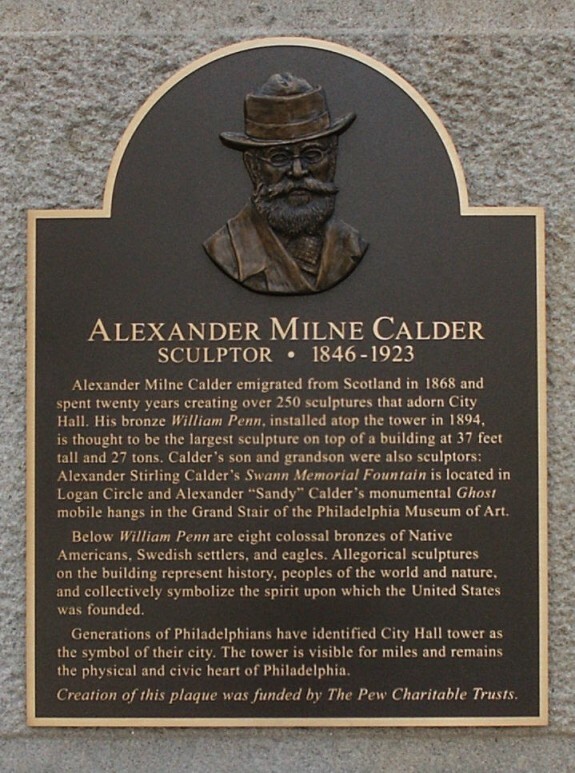 Cast by Alexander Milne Calder (1846-1923), Penn’s likeness was accompanied by 250 additional relief and free-standing Calder sculptures throughout the building, many of them conveying high-minded allegories about the nation and the city. There were other, less commendable reasons for the expense, however. The public buildings commission formed to oversee construction proved a major source of patronage for an increasingly entrenched Republican political machine. A primary force behind the effort was a previously obscure politician, William Stokley (1823-1902), who after his role in the City Hall site selection dominated local politics for nearly than a decade as mayor from 1872 to 1881. 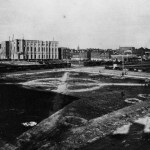 In addition to directing contracts for marble and brick to political allies, Stokley’s role in securing a decision to build a single structure at the intersection of the four quadrants that constituted Penn Square at Broad and Market streets solidified relationships with street rail magnates investing in the Union Line. They used the building commission’s decision to force the rival West Philadelphia Company to share its lucrative right away along Market Street in return for permission to lay its tracks around the new structure. By the time City Hall was complete, its architecture was already considered out of fashion and thus became the object of some ridicule. Objecting to the building’s disruption of traffic as well as its style, city government explored the possibility of demolition in the mid-1950s. When cost estimates came in equal to those for construction and when members of the American Institute of Architects objected to the building’s loss, the city relented. Recent efforts to restore the building have well exceeded the projected cost of its demolition, but the building’s listing on the National Register of Historic Places and its inclusion in a national survey as among the 150 most important buildings in the United States assures its place in Philadelphia for a long time to come. Howard Gillette is Professor Emeritus of History at Rutgers University-Camden and co-editor of The Encyclopedia of Greater Philadelphia. Holmes, George J. and Allen M. Hornblum. Philadelphia City Hall. Mount Pleasant, S.C.: Arcadia, 2003. Lebovich, William L. America’s City Halls. Washington: Preservation Press, 1984. Historic American Buildings Survey, Prints and Photographs Division, Library of Congress, Washington, D.C. The Central District Plan now proposed by the Philadelphia City Planning Commission makes recommendations for better treatment of City Hall. We hope that further renovations, such as new gates into the courtyard and cleaning the entry portals, and activating the courtyard space with programming will encourage all residents and visitors to experience the beauty and majesty of this incredible building. To see our recommendations, please go to phila2035.org. Howard, I always thought of City Hall as a metaphor for the city itself: big, boisterous, ungainly, totally in-your-face and yet endearing. Thanks for bringing all that together in your essay. 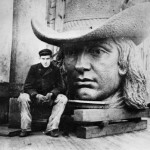 Hello, how was the statue of William Penn placed atop city hall ? And are there pictures? the title is held by Philly City Hall. I have always been to City Hall whenever I went to Center City. When I was at Christmas Village on November 25, 2015, I started hearing the bells toll. They were pretty loud too. Were the bells coming from City Hall? Sorry. I actually went to Christmas Village on November 20, 2015, not November 25, 2015. My mistake. How did they get the statue of Wm Penn on top of City Hall in Phila? In assembling the statue of Wm. Penn on top of City Hall did a man seal himself inside the statue ? It is still considered the world’s tallest masonry building. I was always told that my great grandfather’s company did the installation of Wm. Pen. Have you come across the name Frank W. Hake? I remember going up the elevator in side Wm Penn statue about 1930 to the observation deck than changing to a rickedly open wire cage elevator to the brim of the hat where you could look out…..no one believes me, Heard of one elderly man who said the same thing. Were we dreaming.. Thank you.